In this continuing informational CT scanner blog series, this time we are discussing the CT scanner gantry. The CT scanner gantry is the doughnut-shaped part of the CT scanner that houses the apparatus necessary to produce and detect x-rays in order to create a CT image. The x-ray tube and detectors are positioned exactly opposite each other and rotate around the CT scanner gantry aperture. Continuous rotation in one direction without cable wrap around is possible due to the use of low-voltage slip rings. By definition, a CT scanner gantry is a moveable frame that contains the x-ray tube, including: collimators and filters, detectors, data acquisition system, rotational components including slip ring systems, and all associated electronic accessories such as the CT scanner gantry angulation motors and positioning laser lights. The CT scanner gantry is the largest of all of the CT parts. The rotating frame, rotates at a speed of 100 – 200 RPM. A heavy x-ray tube is mounted on it, as well as a banana-shaped detector arch and other associated CT scanner gantry parts. Electric power, preconditioning lines and signal lines are provided by slipping rings. In the newer models, the signals are transmitted by a wireless system. The inclusion of slip ring technology into a CT system scanners allows for continuous scanning without cables getting in the way. 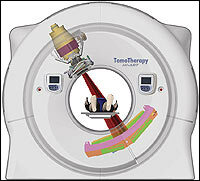 A CT scanner gantry can be angled up to 30 degrees in both directions (forwards and backwards). CT scanner gantry angulation allows the operator to line up the part of the patient’s body which needs to be evaluated with the scanning plane, for precise imaging. In the newer systems, the CT scanner gantry is continuously rotated to acquire important and comprehensive data, as the patient table is smoothly moved through the CT scanner gantry. The resulting route of the tube and detectors, in relation to the patient, forms a helical or spiral path. This powerful concept, called either helical CT or spiral CT, facilitates quick scans of entire regions of interest, in some cases within a few seconds. So significant were improvements in body CT quality and throughput that helical scanning became the standard of care for body CT scanners. This is very important for patients who suffer from claustrophobia. Hospitals or imaging departments of healthcare facilities understand the importance of maintaining an up-to-date CT scanner gantry, as the technological advances allow great patient comfort, as well as much better imaging for diagnosis and treatment. MedWOW has an enormous parts department, with a major focus on CT scanner gantries and other imaging equipment. If you need a replacement CT scanner gantry for your CT equipment, if it isn’t found on the MedWOW portal, the MedWOW parts finder team will conduct a thorough international search and find it for you. There are currently nearly 2,000 CT scanner gantries parts available through the MedWOW marketplace, representing Esaote, GE Healthcare, Ige, Philips, Picker, Shimadzu, Siemens, Toshiba and other manufacturers. MedWOW’s search engines allow you to filter for make, model, price, condition, location and other variables. As a student in radiology I would like to learn what exactly controls the Gantry rotation speed?